Morning is always a "rush for time" scenario. To give my kids a few more minutes of beauty sleep, they need to forego time for a proper breakfast. So the easiest is for them to have sandwiches. My kids were having bread with either peanut butter or nutella for breakfast for the past weeks. Though my son will not get sick of it but I think my girl already getting tired of it. I decided to give them a change since now I am feeling much better and being a weekend, I try to give them a proper breakfast. Thus this morning, I prepared Feathery Banana Pancakes. Am glad that it was finished with a smile on their face. Love the texture of this as it is fragrant with the banana as well as fluffy. So are you having a good family bonding time this weekend? Sift flours, baking powder, sugar, salt and nutmeg into bowl. Whisk the melted butter, egg yolk, vanilla and milk. Beat the egg white till frothy and add in cream of tartar. Beat till firm peak. Pour the whisked liquid into the dry ingredients to form a batter. Fold in the beaten egg white along with the banana. Heat pan and cook batter as per pancake method. Serve hot with warmed maple syrup. I loves pancakes! I just had them yesterday with strawberries slice and honey topping! I loves it with banana too.....usually I will caramalized it a little so to make it more delicious. yes, i had a good day today, had lunch with my parents and brother, also went for foot massage. 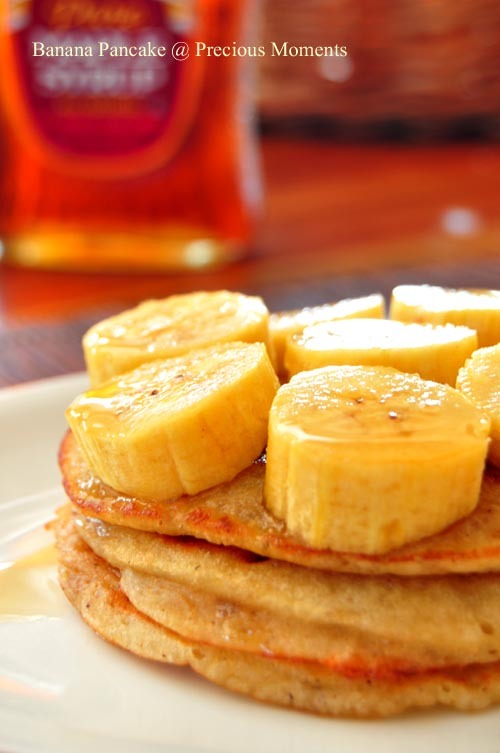 I've never eaten banana pancakes but i can imagine how tasty it is! Happy weekend to you!! Your pancake looks delicious! I was thinking of making some pancakes for breakfast tomorrow! Bonding with the family today, is by cooking instant noodles for dinner today!!! Hehehe! Yup, because we had durians earlier and nobody wants a heavy dinner!! Have a great Sunday, Edith! Mel, next round I try with strawberries too. oops maybe season over? Lena, your day sounded so wonderful. KF, can i trade with your durians? My little space. Go make some.